Fifteen of the nineteen Sept. 11 hijackers were Saudis like Osama bin Laden. Although bin Laden and his followers' primary obsession is ousting the U.S. from Saudia Arabia and other Islamic countries, they also want to topple the Saudi royal family, whom they accuse of corruption and of working against their own people and their Islamic faith. Here are interviews with two key Saudis -- the ambassador to the U.S. and a leading dissident -- as well as significant background readings on the forces confronting this longtime U.S. ally in the Middle East. Dean of the Diplomatic Corps in Washington, he has served as Saudi Arabia's ambassador to the U.S. since 1983. In this interview Prince Bandar argues that while U.S. policy in the Middle East has its flaws, it cannot be blamed for the atrocities of Sept. 11. Prince Bandar also speaks candidly about dissidents within his own country, about relations between Saudi Arabia and other governments in the Middle East, and about the role that Saudi Arabia may take in the fight against terrorism. A Saudi Arabian dissident living in exile in London, Dr. Saad al-Fagih heads the Movement for Islamic Reform in Arabia. 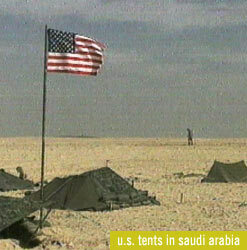 In this interview, he outlines the issues behind anti-Americanism in Saudi Arabia and other Arab nations and explains the Saudi government's dilemma in allying itself with the U.S. in the war on terrorism. This interview was conducted in late September 2001. In an earlier 1999 interview with FRONTLINE Dr. al-Fagih described the loose organization of individuals that make up Al Qaeda. Why is America the Target of Militant Islam? U.S. policymakers, and Saudi and Iraqi dissidents, discuss the reasons for anti-U.S. hatred in the Islamic world. Here are the views of former Senator Warren Rudman (R-N.H.), who served as chairman of the President's Foreign Intelligence Advisory Board from 1997 to 2000; Dr. Saad al-Fagih, director of the Movement for Islamic Reform in Arabia; Edward Walker, former assistant secretary of state for Near-Eastern affairs; Michael Sheehan, former coordinator for counterterrorism at the U.S. State Department; U.S. Deputy Secretary of State Richard Armitage; and Nabeel Musawi, political liaison of the Iraqi National Congress. "Bin Laden and His Followers Adhere to an Austere, Stringent Form of Islam"
"War Against Terror Tests Fragile Relations With U.S."
"Saudi Arabia: Post-War Issues and U.S. Relations"
"Saudi Arabia: A Secret State of Suffering"
"Saudi Arabia Enters the 21st Century"